We know you loved our body butter before but you will crave this newest recipe after you get out the shower each morning. This butter is REAL butter and not a cream. There is no water in this product like some have. 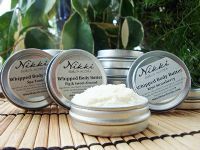 Our butter is a great moisturizer and like real butter it melts and absorb (not coat) on your body to the touch. Our main ingredient is Shea Butter. 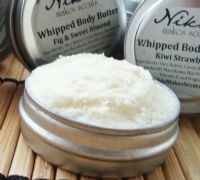 African healers have used shea butter for thousands of years as the ideal treatment for dry or aging skin. Its high content of non-saponifiable fatty acids gives it the ability to moisturize and retain the elasticity of the skin. Shea butter also helps to protect the skin against the damaging effects of the sun while repairing cellular degeneration. Pure quality natural ingredients whipped together in small batches for freshness: Shea butter, cocoa butter, sweet almond oil, jojoba oil, coconut oil, macadamia nut oil, corn starch, vitamin e, essential oils and fragrance. Please note: This is a natural product and a butter. It will melt if exposed to very warm weather. Store in a cool dry place. I just wanted to say...your Body Butter ROCKS!!! LOVE the way it melts in my hands. The smell of the Tropical Guava is so sumptuous! I find myself wishing I had more skin just so I would have an excuse to rub more of this luscious body butter all over me! My skin loves it. I'll definitely have to get a full-size jar of it soon!